Do you wake up in the middle of the night wishing you knew more about electrons and neutrons? Do you cry yourself to sleep worrying about bromine? Look no further, help is at hand. All of my recent undergraduate pupils scored >70% in their organic chemistry exams. 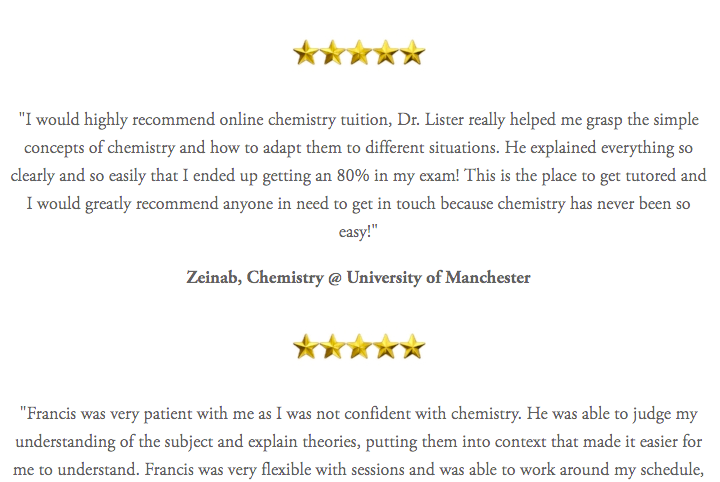 I tutor online with an electronic whiteboard, supply additional notes as well as provide feedback and proof-reading if required. If you are based in London we can also meet in person. Please feel free to get in touch with any questions! I think the key to understanding a subject is a good teacher - click the links to find out more.